Meet hitchBOT, a robot who will hitchhike across Canada and tweet his adventures to the world. 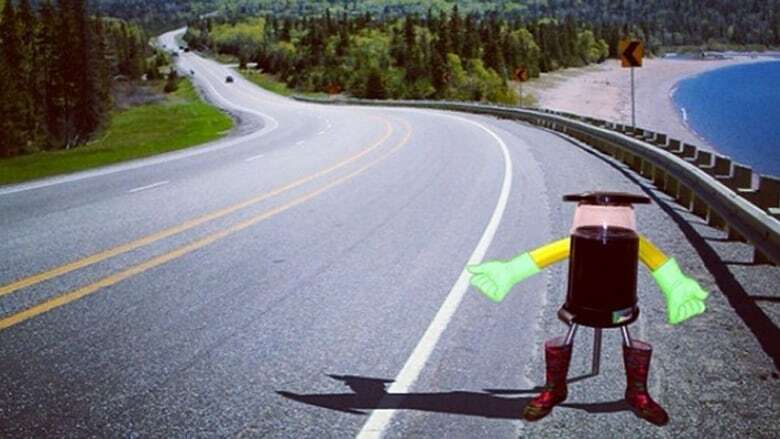 A chatty robot from Ontario will attempt to hitchhike from Nova Scotia to B.C. this summer. HitchBOT will be about the size of a six-year-old child and have a child booster seat built into its buttocks, says David Harris Smith, an assistant professor at McMaster University who first came up with the idea of creating a collaborative art project centred around a hitchhiking robot. The little robot will try to bum its first ride from the Nova Scotia College of Art and Design on July 27 by signalling with the only part of its body it can move — one arm. The researchers expect it to charm its way into enough rides to make it all the way to Victoria. Along the way, it will be sharing its adventures via social media — something that those who pick it up should be aware of, Smith told CBC News. "It'll be sort of like having an out-of-control teenager in your car, taking pictures of you and posting them to Facebook." HitchBOT is also equipped with a GPS and 3G wireless connectivity that will allow it to post frequent updates of its position on the internet. Drivers who aren't comfortable being part of hitchBOT's public story shouldn't take it with them, said Frauke Zeller, an assistant professor at the School of Professional Communication at Ryerson University and the other lead researcher on the project. On the other hand, Smith said, "If people want to take it home to meet the family or to a party or something, they can do that — if hitchBOT consents. It's up for side adventures along the way." Although its creators are researchers, hitchBOT isn't part of a research project — something that typically takes place in a controlled environment. Rather, it's a collaborative, conceptual art project: "We are releasing it, really, into the wild," Zeller said. The goal is to get people to think about and discuss some of the ideas surrounding technology and our perception of public safety. "A lot of the discourse around robots has been, you know, will they take over, can we trust robots?" Smith said. "And this art piece very deftly reverses that whole discussion — can robots trust people?" On the one hand, since hitchBOT can't move, it won't have much choice about whether to trust people or not, Zeller acknowledged. But its virtual self will be able to share its experiences. "Basically, the whole nation is watching via social media," she said. On the flip side, hitchBOT's sophisticated communication features are aimed at helping it gain the trust of humans, Zeller added. The robot will have voice recognition and processing abilities that will allow it to make small talk with its voice. It will even be able to draw on Wikipedia for conversation topics. It will also have an LED screen so it can message humans using text, and can make some facial expressions. And it will be able to hold text conversations with multiple people at the same time over the internet. HitchBOT will be powered with solar panels covering the beer cooler bucket that makes up its torso, and can also be recharged from car cigarette lighters or a regular outlet. But if hitchBOT's power runs out as it is waiting for its next ride, written instructions on its body will tell people how to strap it into the car and plug it in, and direct people to a help website. The rest of its construction will be pretty low-tech, as the only movement it can make will be with its hitchhiking arm. A photo posted on the hitchBOTInstagram account Monday showed that the robot's head is made from a cake saver, "which will protect all of my brain parts, including LEDs, plastic bearings, motors and a mirror," it says. It tweeted that its body is still "a work in progress."